PHUKET: Forest protection officers arrested two men for illegal encroachment after helicopter surveillance revealed signs of forest destruction in Phuket. Panumet Dam-on, chief of the Phuket Forest Protection Unit, said officers spent three hours in a helicopter on February 8 searching for signs of encroachment. The team flew over three sites. The first was Bang Khanoon forest reserve in tambon Thepkrasattri, two-thirds of which has already been destroyed. Finding no new signs of destruction there, officers surveyed the heavily forested Nakkerd and Kamala hills. They spotted three new patches of destruction in both areas with six plots between two and three rai in area. On the morning of February 11, officers visited one of the sites in the Kamala Hills, where they found two men cutting down trees. They arrested Samart Phokham, 41, from Maha Sarakham, and Daeng Porgwang, 52, from Nakhon Phanom. They confiscated an ax, a knife and a shovel as evidence. The two men confessed to illegal encroachment after being hired by a man named ‘Lo’. They did not know Lo’s real name or where he lived, they told police while in custody at Thalang Police Station. 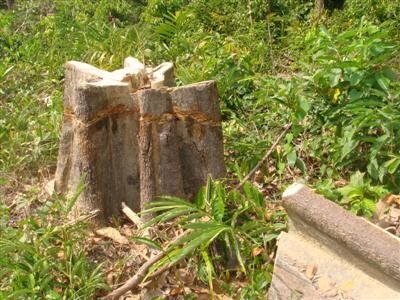 The encroachment areas were probably being cleared to be used as rubber or palm oil plantations, Mr Panumet said. A new road cutting through a hilly forested area in tambon Pa Khlok was also revealed by the aerial survey, Mr Panumet said. “We’re still in the process of checking land titles for that one,” he said. “The rangers are working hard to protect the area,” he added.